Every day, resident physicians treat patients whose health has been compromised by a system that costs too much and leaves too many behind. The United States provides some with the high quality care they want whenever they want it, but for far too many, the neighborhood that you live in, the amount of money that you make, your race, your gender, your sexual orientation, or your birthplace impacts your health and well-being far more than the choices you make or any treatment we can prescribe. Despite the progress made by the Affordable Care Act, we believe that a commitment to health justice for all requires us not only to be healers for our patients but advocates. We may never achieve full equality, but we should never accept anything less than basic fairness. There are several issues that CIR members have advocated for as a result of this definition. CIR physicians have advocated for adequate funding for healthcare. This includes fighting against drastic and ill-advised cuts, and for continued support and investment in safety-net healthcare institutions and public programs like Medicaid, the Children’s Health Insurance Program, Medicare, and funds devoted to institutions that treat a disproportionate number of uninsured patients. CIR physicians have advocated for expanding access to healthcare for more Americans. This has included efforts to pass single-payer healthcare in individual states, tightening regulations on insurance companies, and improving mental health coverage parity. CIR physicians have also advocated for expanding access to healthcare for those living and working in the U.S. This has included efforts to pass commonsense immigration reform; to eliminate waiting periods for green card holders to access public health programs; and to provide a means for undocumented workers and the children of undocumented immigrants to gain reasonable access to healthcare coverage beyond the Emergency Room. CIR physicians have advocated for public health measures, gender equality, and policies that would address the social determinants that lead to persistent disparities in care for people of color, for the LGBT community, for low-income working families, and for immigrants. This includes championing family-friendly legislation like paid sick days and paid family leave; supporting efforts to pay full-time workers a living wage sufficient to raise their families through the Fight for $15; requiring inspections of asthma triggers in rental housing; increased funding for language access and cultural competency training; and environmental justice issues related to urban environments and climate change that jeopardize our patients’ health. CIR physicians have advocated for themselves, as union members, and in solidarity with other union members against efforts to curb the right to form a union. Through legislation and through lawsuits, there has been a concerted effort to make it harder for working people to stick together and pool resources, and to limit the power of teachers, firefighters, child protection workers, nurses, and other public workers to advocate for our children, our safety, and for respect in the workplace. CIR physicians have spoken out against the passage of so-called “Right to Work” laws in New Mexico which would have affected our own members and against cases on these issues before the Supreme Court that would affect all public sector workers, including approximately 8,000 CIR physicians. 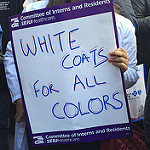 Finally, CIR physicians have advocated around issues that are specific to physicians and physicians-in-training, including for additional funding for Teaching Health Center residency slots, the National Health Service Corps and against the mandatory drug-testing of physicians, restrictions on physician free speech, extreme changes to medical malpractice laws, and cuts to Graduate Medical Education.